Well, I only found 13 caches this week, but what a week! Now I’ve found caches in 115º heat (in Vacaville, CA) AND in ankle-deep snow at -24º with a wind chill of -50º in Edmonton, Canada! I was out with Kokoscoot, a local cacher, between 11am and noon! Now I need to get to Death Valley and Mount Whitney for different highs and lows….. This week took me to Farmington, NM,, and to Edmonton, AB, Canada for singing work, first with Beethoven’s Wig, then with Sixth Wave. On Thursday morning, at 8:20am, I was dressed in a full ball gown, makeup, glittery jewelry, and ready to go, when I got the call that snow had closed the school and the show was cancelled! What now? I changed into warm clothes and went caching, of course! The weather cleared up over the course of the morning, and the first two were conveniently on either side of the hotel. One was attached to a phone pole and the other was a light pole, so they were easy to grab in the few inches of snow. The third was a mile walk away, but by that time, the sun was out, and I could see a nice view of the surrounding bluffs. This cache was an ammo can in a tree in the owner’s front yard, so I swapped out some TBs, and had a nice, long stroll back. Friday was all about performing, and the day after that was all about getting out to Camp Nakamun, 50 miles NW of Edmonton. The photos on their website look nothing like it was, as it was buried in a foot of snow and the lake was completely frozen over with a hockey rink on it. Sixth Wave was there to work with three local jazz choirs and perform with them in nearby St. Albert. Our cabins were about .1 from the main lodge where we ate and rehearsed together, so we got to enjoy the REAL winter weather just going back and forth. One of the choir directors and hosts is an avid cacher (aka Kokoscoot) with over 2,000 finds, and he has a cache hidden near the entrance. He wasn’t sure that even he could find it buried somewhere in the trees, so I had to pass on that one…. aargh! On Sunday, in St. Albert, though, there was a library cache in the same building at the theater where we performed! Score! The next day was the big event: 6 finds and 1 DNF in the above-mentioned ridiculous temperatures. Even Kokoscoot has never been out when it’s that cold, and it gets that way a couple times a year up there, but when you get TWO obsessed cachers together, the obstacles become the fun! I’ll let you read my logs for more details on the finds. The last two were about 450′ and 970′ respectively from parking down a path with ankle-deep snow. This is kind of a long way to run with numb toes. The sun came out while we were out there, and the sojourn back along the frozen river was through really lovely scenery. One Last Goodbye! [Take 2] – DNF! Happy Birthday To You……..2 Here’s where I saw the chickadee. This was an unforgettable experience, indeed, and one that I never would have even considered were I not an obsessed geocacher. Kokoscoot is spending a year in Namibia, Africa, where he goes often to conduct choirs, and I hope to visit him there for caching adventures of an entirely different kind. My week was wrapped up with three newer local caches, one of which afforded a grand vista of the San Fernando Valley and our own snow-covered mountains to the north. These, however, I found without even putting a jacket on. Ah, I fear that the coming week’s caching will be much more mundane… but who knows? There is an event planned by Westward Ho, and that will certainly not be mundane. Happy caching until next week! I’m posting a day early, because I’m heading out of town on Wednesday to perform in Farmington, NM, and near Edmonton, AB, Canada! I won’t have time for more than a few caches, which is just as well, as it will be COLD and SNOWY! This week, I headed north to perform in my hometown of Yreka, CA, with my a cappella group, Sixth Wave. It was quite an experience, as in the audience were my childhood teachers and friends of my parents whom I hadn’t seen since I was a kid! Emitter – DNF! This one flummoxed me, darn it. RFDCache Arg! I looked for this one TWICE, and even with a hint, I missed it…. Hey… just because I’ve found a lot doesn’t mean I’m really good at it…. LOL! That’s it for this week! Until next time, happy caching! Welcome back to this, my second installment in this new adventure of The Blog. 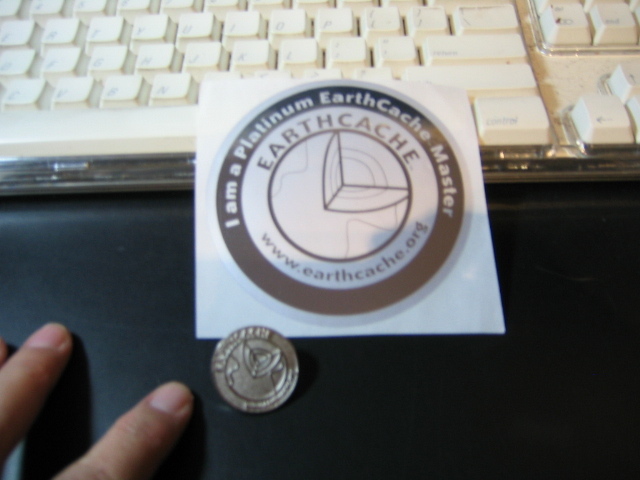 First, I’d like to show you my new pin, awarded for platinum earthcache masters: finding 20 in 5 states and hiding 3. Actually, I do enjoy earthcaches, as I always enjoy learning something new. This week I got more caches in than last week. On Saturday, I went to Pasadena and Sierra Madre with 2 of my “usual suspects”: f0t0m0m and OLdweeb. We did a minimal amount of hiking and a couple dozen urbans. The highlight of the day was finding two caches that involved contacting a cacher in VA for alternate waypoints. Our partner there in Alexandria was Team Weathergirl. I Never “Promised” Max a Pansy Patch! MATTERSVILLE – inside a Goth shop! VINA VIEJA PARK – DNF! Bicycles and Bunnies – DNF! Did I Hear You Say That There Must Be A Cache? On Sunday, I went caching around Eagle Rock after singing a funeral in the area, and found five quick hide-a-keys while wearing a dress and heels! My week was capped off with a few in the San Fernando Valley today as I was running errands. I think the piéce de resistance of my week, though, was hiding Le cache est mort! Vive le cache! How much should I give away? Let’s just say, it’s fitting memorial for the THREE caches I had there previously in a tree that’s no longer there! One more tidbit: I found this while looking for other blogs and such on geocaching. It looks like a really nice collection of geophotos. Do you have a favorite blog or geocaching site? Please comment and let me know. Until next week! Cache on! Welcome to my new blog! I’ll post each week about my recent adventures in geocaching. Please feel free to ask questions and/or make requests for topics, however, this is NOT a forum, so please comment accordingly. I’m also in the process about writing an E-Book (available in PDF format) about my experieces thus far, so this blog will primarily focus on my contemporary experiences, at least to begin with. OK, so what have I found since 1/1/08? Er… not a heck of a lot, surprisingly enough, although I am managing to hold my #3 spot with 14,547 finds. I’ve mostly been recovering from a long road trip through 6 states (and I’m talking BIG states! ): NV, AZ, UT, ID, OR, and CA to visit relatives. Along the way, I found enough Earthcaches to qualify as a platinum master. Yee haw. We got some pretty good visibility, and it’s a great place to hike in the winter, as there is NO shade. The wind kicked up at the top, and I was actually really cold. Let’s Go to Palm Springs! (sigh) It’s always sad to let one of your babies go…..
Until next week – cache on!